A list of U.S. Army servicemen reporter either killed or missing during World War II. 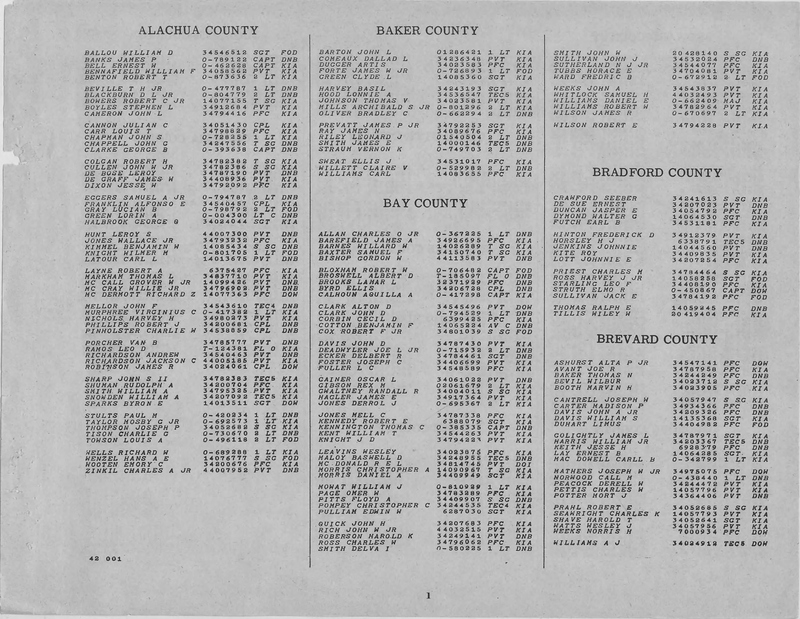 This particular page shows servicemen from Alachua, Baker, Bay, Bradford and Brevard Counties, Florida. A notable soldier listed in this record is Private Van Buren Porcher (d. 1944), who was born in Alachua County, Florida. Porcher was married twice in Gainesville: first to Taresa May Aldridge in 1933 and then to Hattie Smith in 1939. After enlistment, Pvt. Porcher was assigned to the U.S. Army's 448th Quartermaster Troop Transport Company on May 28, 1943. While serving in World War II, Pvt. Porcher was Killed in Action (KIA) on September, 2, 1944. He is currently buried at Epinal American Cemetery and Memorial in Dinozé, France. Digital reproduction of original record, 1946: National Archives Identifier 305285, Record Group 407, Modern Military Records LICON, Textual Archives Services Division, National Archives at College Park, College Park, Maryland. Record Group 407, Modern Military Records LICON, Textual Archives Services Division, National Archives at College Park, College Park, Maryland. "Van Buren Porcher." FamilySearch. https://familysearch.org/ark:/61903/1:1:VRZ9-JLY. "Van Buren Porcher." FamilySearch. https://familysearch.org/ark:/61903/1:1:VRZ6-879. 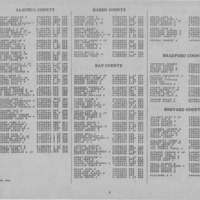 “World War II Honor List of Dead and Missing Military Personnel from Alachua, Baker, Bay, Bradford, and Brevard Counties.” RICHES of Central Florida accessed April 23, 2019, https://richesmi.cah.ucf.edu/omeka/items/show/9360.